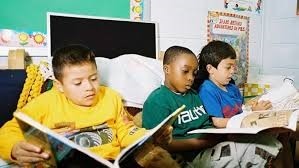 NEW YORK — Nearly 6 out of 10 young people ages 6-17 say they read for fun, according to a new study from Scholastic and YouGov, a percentage that has dipped slightly since a 2010 report. Fifty-eight percent of those surveyed said they either loved reading for fun or "liked it a lot." In 2010, 60 percent gave similar responses. The 12-14 age group had the biggest drop, from 61 percent to 50 percent, while ages 15-17 improved from 50 to 54 percent. Among the most positive findings: 40 percent of families say they began reading to their children when they were three months old or younger, compared to 30 percent in 2014. The Harry Potter series was a favorite choice for both kids and parents. The Junie B. Jones books and the Diary of a Wimpy Kid series were popular, too. Yesterday’s report also shows that young people prefer their books the old-fashioned way, with around two-thirds saying they only want to read on paper. Among those who did read an e-book, nearly half said they liked paper more, while only 16 percent favored the digital format. The remainder had no preference.